In this eastern portion of Andromeda, the bright star Mirach (Beta Andromedae) appears down and to the left of the great Andromeda galaxy, M 31, while Almach (Gamma) is toward the far left. Lambda And is the brightest star toward the upper right corner; Psi And is just to the left of it. M 32 lies just down and to the left of M 31; the galaxy NGC 205 is just up and to the right. Triangulum is near the lower left corner, its galaxy M 33 just visible. 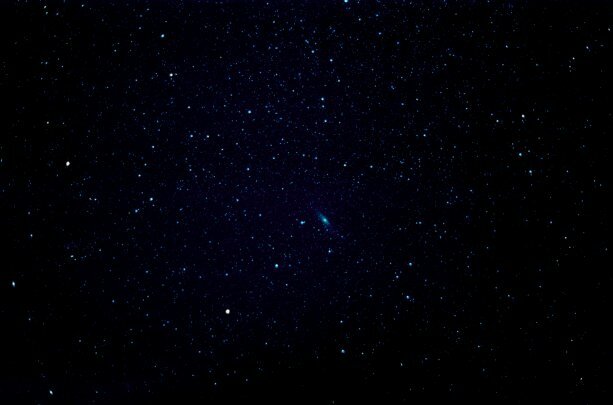 The highest resolution image (see below) records stars to tenth magnitude. The faint-star limit drops toward the edges of the picture because of vignetting in the camera, rendering M 33 anomalously dim. The full resolution image reaches to mid-tenth magnitude.